It is interesting to note that this Swiss infantry which had so impressed Machiavelli was no part of the princely system of Europe. At the very centre of the European system there had arisen a little confederation of free states, the Swiss Confederation, which after some centuries of nominal adhesion to the Holy Roman Empire, became frankly republican in 1499. 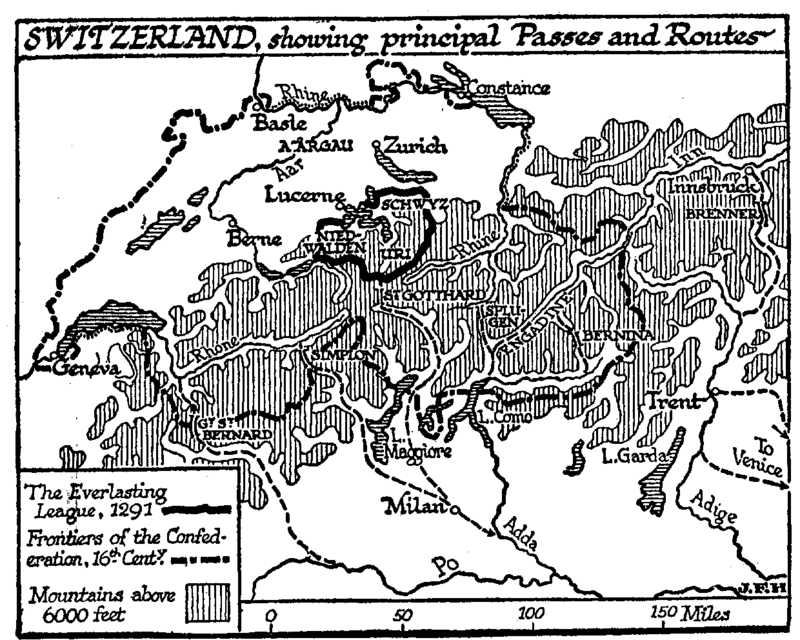 As early as the thirteenth century, the peasant farmers of three valleys round about the Lake of Lucerne took it into their heads that they would dispense with an overlord and manage their own affairs in their own fashion. Their chief trouble came from the claims of a noble family of the Aar valley, the Habsburg family. In 1245 the men of Schwyz burnt the castle of New Habsburg which had been set up near Lucerne to overawe them; its rains are still to be seen there. This Habsburg family was a growing and acquisitive one; it had lands and possessions throughout Germany; and in 1273, after the extinction of the Hohenstaufen house, Rudolf 61 Habsburg was elected Emperor of Germany, a distinction that became at last practically hereditary in his family. None the less, the men of Uri, Schwyz, and Unterwalden did not mean to be ruled by any Habsburg; they formed an Everlasting League in 1291, and they held their own among the mountains from that time onward to this day, first as free members of the empire and then as an absolutely independent confederation. Of the heroic legend of William Tell we have no space to tell here, nor have we room in which to trace the, gradual extension of the confederation to its present boundaries. Romansh, Italian, and French-speaking valleys were presently added to this valiant little republican group. The red cross flag of Geneva has become the symbol of international humanity in the midst of warfare. The bright and thriving cities of Switzerland have been a refuge for free men from a score of tyrannies.